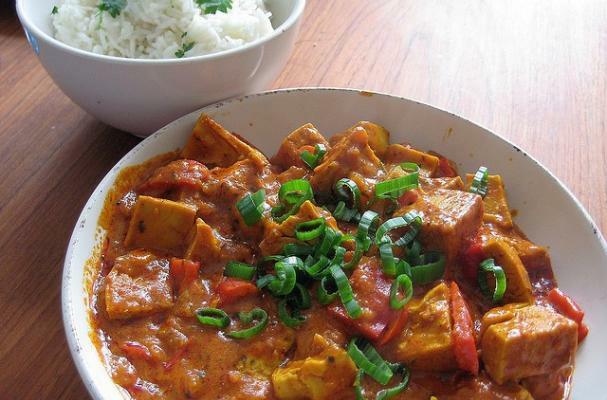 Chicken tikka masala is a popular Indian dish that can be made right in your very own kitchen. Cubes of chicken are stewed with yogurt and Indian spices. The result is a tender pieces of chicken in a thick and fragrant sauce that is absolutely delicious. Some recipes call for red food coloring but I urge you not to add it. If you are looking for the deeper red color, add some tomato paste instead. Chicken tikka masala is traditionally served with fluffy basmati rice and warm naan. This will be an Indian dish that everyone in the family will love. Cut the chicken into 1-inch cubes. Sprinkle with 1/2 teaspoon salt from the specified amount, and the lemon juice. Mix thoroughly. Cover and keep aside for 30 minutes. Put the rest of the ingredients into an electric food processor or liquidiser and blend until smooth. Put this marinade into a sieve and hold the sieve over the chicken pieces. Press the marinade through the sieve with the back of a metal spoon until only a very coarse mixture is left. Coat the chicken thoroughly with the sieved marinade. Cover the container and leave to marinate for 6-8 hours or overnight in the refrigerator. Preheat oven to 230 degrees C/450 degrees F/Gas Mark 8. Line a roasting tin with aluminum foil (this will help to maintain the high level of temperature required to cook the chicken quickly without drying it out). Thread the chicken onto skewers, leaving 1/4-inch gap between each piece (this is necessary for the heat to reach all sides of the chicken). Place the skewers in the prepared roasting tin and brush with some of the remaining marinade. Cook in the center of the oven for 6-8 minutes. Take the tin out of the oven, turn the skewers over and brush the pieces of chicken with the remaining marinade. Return the tin to the oven and cook for a further 6-8 minutes. Shake off any excess liquid from the chicken. (Strain the excess liquid and keep aside for Chicken Tikka Masala). Place the skewers on a serving dish. You may take the tikka off the skewers if you wish, but allow the meat to cool slightly before removing from the skewers.